Here is a fake letter from Honzagool. Although the letter looks real and that is indeed the signature of Honzagool at the bottom, the proof that this letter is fake is that the envelope in which it came was postmarked New York City with the return address "Raja, 542 W. 112st. #5-D, N.Y.C. 10025". When Honzagool left America on August 28, 1982 never to return, the deal the Prince made with Raja Ehsan Aziz and his group was that Honzagool would sign her name to a bunch of blank sheets of paper. Then, Raja and the others could write letters in her behalf. Not only did Honzagool not write this letter, but she could not possibly have even known about it. She lived in Chitral in one of the most remote regions of the world. There was no telephone service or even electricity in her village of Damik and she could not travel elsewhere because of the purdah system. Even mail would have taken one month to reach Chitral. Raja Ehsan Aziz had never in his life been to Chitral. However, he was a political organizer with the Jamaat-e-Islami political party and wanted to marry my wife to his brother, Raja Abdul Rashid. This motivated him to write this and other letters. Unfortunately, it was not true that Honzagool wanted her daughter back. 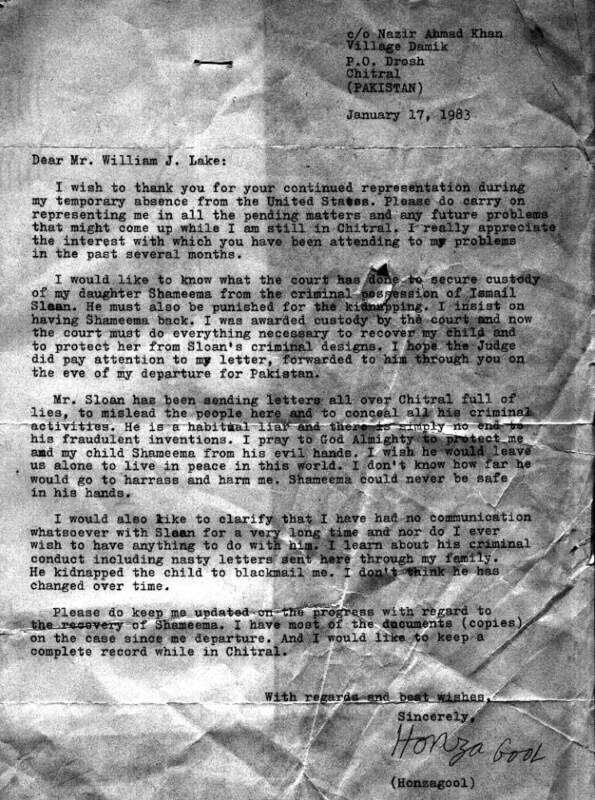 In the 17 years since the date of this letter, many of her relatives in Chitral have tried to get her interested in her daughter, without success. Although William J. Lake vigorously represented Honzagool in 1982, he got sick in 1983 and went into Veterans Hospital. He died of a mysterious disease in June 1984. AIDS was unknown at that time. This letter was found by me among his papers after his death. I wish to thank you for your continued representation during my temporary absence from the United States. Please do carry on representing me in all the Pending matters and any future problems that might come up while I m still in Chitral. I really appreciate the interest ;with which you have been attending to my problems in the past several months. I would like to know what the court has done to secure custody of my daughter Shameema from the criminal possession of Ismail Sloan. He must also be punished for the kidnapping. I insist on having Shameema back. I was awarded custody by the court and now the court must do everything necessary to recover my child and to protect her from Sloan's criminal designs. I hope the Judge did pay attention to my letter, forwarded to him through you on the eve of my departure for Pakistan. Mr. Sloan has been sending letters all over Chitral full of lies, to mislead the people here and to conceal all his criminal activities. He is a habitual liar and there is simply no end to his fraudulent inventions. I pray to God Almighty to protect me and my child Shameema from his evil hands. I wish he would leave us alone to live in peace in this world. I don't know how far he would go to harass and harm me. Shameema could never be safe in his hands. I would also like to clarify that I have had no communication whatsoever with Sloan for a very long time and nor do I ever wish to have anything to do with him. I learn about his criminal conduct including nasty letters sent here through my family. He kidnapped the child to blackmail me. I don't think he has changed over time. Please do keep me undated on the progress with regard to the recovery of Shameema. I have most of the documents (copies) on the case since me departure. And I would like to keep a complete record while in Chitral.